Elizabeth Brandon "Garden Florals" are giclee prints which were the flower art for USPS Forever Stamps 2017 called Flowers from the Garden. 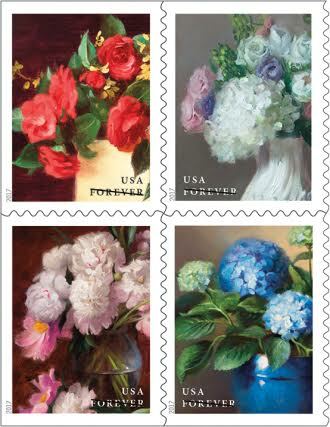 Elizabeth Brandon has been chosen by the United States Postal Service for four of her florals to be used as Forever stamps in 2017. Elizabeth is known for her still life's including florals, fruits, and vegetables. Previously, she created the cover paintings for Cook’s Illustrated magazine culminating in 48 covers over seven years. The four Floral stamps, titled “Flowers from the Garden", will be arriving this year. The Forever Stamp images were designed by Derry Noes from the four original florals by Elizabeth. Elizabeth draws her inspiration from the 17th Century Dutch Masters and the energy instilled in arrangements of living flowers. Her compositions are illuminated by light and rhythms of contrasting shadows. Most of her flowers come from her garden, family, and friends. You can view and purchase a fine art canvas print of each stamp of the complete floral image on the following page.